Why Even More People Suddenly Have Hypertension - What Happened? 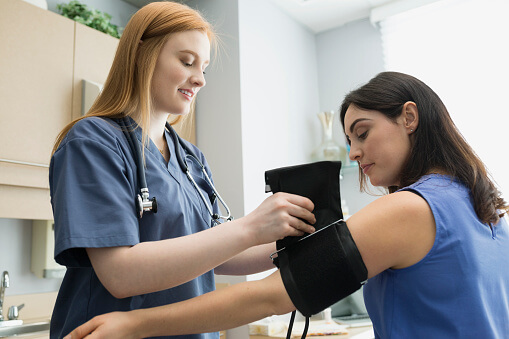 Nearly half of American adults may now have hypertension (high blood pressure), according to new diagnostic guidelines released this past Monday. For the last 14 years, the determination for hypertension status used to start at a blood pressure reading of 140/90 or higher. Now, what is classified as hypertension is a blood pressure reading of 130/80 or higher. The upper number in a blood pressure reading is called the systolic blood pressure. This number indicates how much pressure your blood is exerting against your artery walls when your heart beats. The lower number is the diastolic blood pressure, which indicates how much pressure your blood is exerting against your artery walls while your heart is resting between beats. The best way to determine if you have a high blood pressure is to get tested by a doctor or medical professional. There are at-home kits you can use, but you may want to use these as a tool to check your blood pressure in between doctor visits. Persistent elevated blood pressure may cause clogged arteries, heart attacks or strokes. It may also damage blood vessels, causing kidney impairment, loss of vision, erectile dysfunction, memory loss, fluid in the lungs, angina and peripheral artery disease. Hypertension essentially causes the heart to work too hard and make the blood vessels not work as well as they should. It has been reported that heart attack and stroke are the two leading causes of death in the world. “Often called the “silent killer” because there are often no obvious symptoms, hypertension accounts for more heart disease and stroke deaths than almost all other preventable causes. It’s second only to smoking,” reports the American Heart Association (AHA). According to AHA’s new guidelines, 46% of U.S. adults are identified as having high blood pressure. Under the old guidelines, the number was less at 32%. More than half of all African-Americans now have high blood pressure under the new guidelines: 59% of African-American men (up from 42%) and 56% of African-American women (up from 46%). 47% of white men and 41% of white women now have high blood pressure. A blood pressure of 120/80 is still considered normal. These new guidelines were determined after years of research. The goal is to encourage us to be more proactive and take preventative measures for addressing diseases that are killing way too many Americans. The hope is that more people will take care of their blood pressure earlier and before they have more advanced stages of hypertension. And even though more people will now likely be diagnosed with hypertension, the goal is not to simply treat high blood pressure with medication. Instead, the goal is to get people to adopt certain lifestyle changes earlier, control their blood pressure and reduce the likelihood of disabling diseases or death. So how can you be proactive about preventing hypertension? 1. Avoid overtreatment and get an accurate reading of your blood pressure. 2. Get a pet. There is evidence that pet ownership may be associated with lower blood pressure levels. 3. Avoid smoking and get adequate physical activity. 5. Get enough healthy sleep. 6. Limit alcohol consumption (no more than two drinks a day for men, and no more than one drink a day for women). Potassium. Reducing your sodium intake can help to lower high blood pressure. But a good balance of sodium and potassium can also help to reduce blood pressure. Increasing your potassium intake while reducing your sodium intake in your diet may improve hypertension. Increased potassium can offset the adverse health effects of sodium. Studies show that the sodium/potassium ratio intake should be less than 1. The American Heart Association recommends a maximum daily intake of 1,500 mg of sodium, but most of the American population consumes much more than this. Stay away from processed foods, which often have a lot of added sodium. A review of 19 clinical studies confirmed that potassium had a positive effect in lowering high blood pressure. Foods rich in potassium include figs, dried fruits (prunes and dates), nuts, avocados, bran cereals, lima beans, broccoli, peas, tomatoes, potatoes (especially their skins), sweet potatoes, winter squash, citrus fruits, cantaloupe, bananas and kiwi. And here’s a tip: dried apricots contain more potassium than fresh apricots. Milk and yogurt are also good sources of potassium. If you are a meat and/or seafood eater, red meat, chicken and fish are also rich in this mineral. Magnesium. This mineral is widely regarded for its muscle-relaxing properties, which may help people with high blood pressure. A review of 22 studies on magnesium and hypertension showed a 3-4 mm Hg reduction of systolic blood pressure and 2-3 mm Hg reduction of diastolic blood pressure. Now, cardiologists are even treating heart disease and patients who have had heart attacks with magnesium. You don’t want to have too much or too little of this mineral (or any nutrient for that matter), so talk to your doctor or a competent healthcare professional about taking a nutrition test, in order to determine if you have any nutrient imbalances. Food sources of magnesium include leafy green vegetables (like spinach), legumes, nuts, seeds and whole grains. Foods with fiber are also good sources of magnesium. Many cereals are fortified with magnesium. Calcium. This mineral is important for a healthy blood pressure, because it helps blood vessels contract and loosen when they need to. Magnesium actually helps keep calcium levels balanced. This does not mean that you should have high levels of magnesium and low levels of calcium. Again, it is very important to have everything balanced. For dietary sources of calcium, click here. Vitamin D. According to the National Institutes of Health (NIH), a growing body of research suggests that vitamin D may help treat diabetes, hypertension and other health issues. Food sources of this vitamin include salmon, swiss cheese, eggs, mushrooms, fortified orange juice and cereals and milk. Vitamin E. A study conducted by the NIH found evidence that this vitamin may reduce blood pressure in mild hypertensives. Dietary sources of vitamin E include sunflower seeds, avocados, almonds, mango, spinach, pumpkin, Brazil nuts and peanut butter. Folate (folic acid). There is evidence showing a deficiency in folate is associated with high blood pressure. A study showed that an extra intake of folic acid lowered blood pressure. For food sources of folate, click here. Vitamin C. It has been reported that high doses of vitamin C may reduce high blood pressure. Vitamin C may act as a diuretic and remove excess fluids from the body. This, in turn, may help reduce the blood pressure in your blood vessels. You also need to be mindful of over-the-counter (OTC) drugs, like cold medicines, and how they may affect your blood pressure. For example, some decongestants may raise blood pressure. For a more detailed guide, click here. Read labels carefully and, as always, consult your doctor about OTCs and prescription drugs. For more articles on how to prevent or control hypertension, read here.